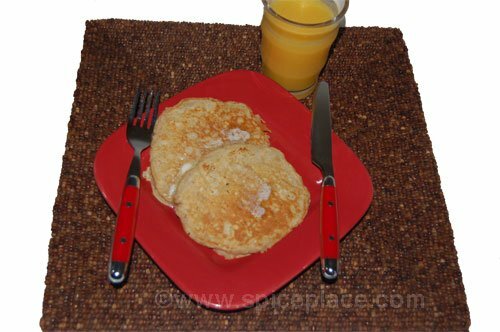 On October 1, 2006, Raquelita posted a deliciously sound breakfast recipe for Apple-Cinnamon Pancakes. These cook and come out just like regular pancakes (bubbles and all) and have a delicious apple taste. Not too sweet. I simply served them with a little butter on top. It seems they'd be good with a little maple syrup on top too. Raquelita's recipe calls for chopping up the apple really fine. I didn't grate that fine and simply grated the apple with my Kitchen-Aid grater attachment. That resulted in a 1/4" or so wide piece of apple similar to the grating from a hand grater. One good sized apple will give the required 1 cup of grated apple. Once the apple is cooked, it's soft and you won't notice the larger sized pieces (i.e. this isn't a potato pancake). 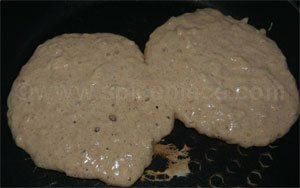 Below is a picture of the pancakes cooking. If you look closely you can see the coarse grated apple in the batter. I bet you could top them with warm pecans in homage to the fluffy german kind. Great recipe! These are so good! These look like a must for Sunday morning breakfast! Apples and Cinnamon simply Yummy! I like the idea Cooker had of adding pecans.